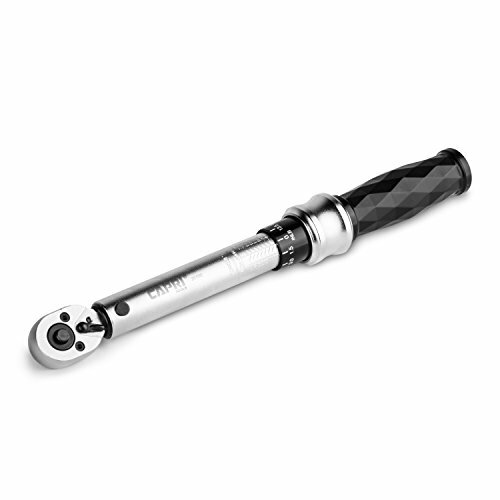 An inch-pound torque wrench is a slightly specialized torque hand tool. Well, because it’s just a little bit different than a standard torque wrench. It’s a pretty important difference, actually and is definitely the right (correct) tool to use when it’s duty is called for. Read below to see how it’s alike and different from it’s more common brother. And then understand why you should probably use it if your project or job is asking for one. This little bit of knowledge gained could potentially save you hours of frustration, not to mention a lot of money. This tool is fascinating for a couple of reasons. First, it allows you to use leverage to tighten down bolts of many sizes and applications. In doing so, it’s second and most important feature and design is to help you tighten bolts to the exact point they need to be. We’re talking precision here, folks. This is crucial because it cuts down the risk of damaging the materials you’re working with, such as sensitive plastics or alloy metals. An inch pound torque wrench in it’s basic definition is just a regular ratchet in that it lets you turn bolts of various sizes more easily, using leverage and reverse rotation. As you turn in one direction one full rotation you can tighten your fastener until you run out of room. Then, reverse the direction to reset the tool’s position. Depending on it’s drive size, usually 3/8′ or 1/2″, you snap on any number of adapters called sockets to fit the heads you’re working with. Moving on to the special function of this type of tool, the inch-lb. torque wrench does indeed have a specific purpose. It’s goal is to slowly tighten a fastener to the precise point you need. The degree of effort required at this point, no more and no less is measured in pounds of pressure that is placed on a perpendicular axis to the fastener. How close this pressure is to the point that receives the force is important. You know this if you try to swing a really long pole at a ball versus if you just had a much shorter baseball bat. The shorter distance is going to give you much lower torque. And that’s what an inch pound torque wrench does. It gives it’s strength, if you will, in inches to pounds. This is nothing more than a system, albeit actual, to follow when building things that require precise pressure. An inch pound torque wrench allows you set a desired measurement and then “clicks” when it’s time to stop. You input this inch-pound setting ahead of time. Most of these tools use a dial or rotating shaft. Professionals who can afford it might use a fancy digital (electronic) inch pound torque wrench. These nifty devices come in a few different “sizes”. For example, you’ll often see a 20″-200″ torque wrench. This one would serve you well, unless you need a 10″ setting for your particular task. Keep that in mind before you buy. One that starts at 0″ may be all you need for your particular applications. Why Use an Inch Pounds Torque Wrench? As mentioned above, the inch version of this tool is different from the more common foot version. It’s true that manufacturers will use the latter version more often; but, there are times when the inch-pound is required. You might ask yourself, do I really need to invest in another tool that pretty much does the same thing? After all, feet are made up of inches right? And a pound is a pound in either case. Can’t I just divide by 12 (12 inches in a foot), and use my regular torque wrench? This is just converting inch pounds to foot pounds, and this “work-around” torquing method is not usually recommended. Essentially, you just don’t get the same precision. This may not matter in many cases, but if you need to be dead-on, don’t mess with it. The rule is that you really can’t torque to inch-pounds on a foot version. It’s not conversion you can trust at all. On the other hand, some will say that it’s ok to torque from inches to pounds. Depending on what you’re doing, you can certainly try it. Jst do the math correctly before you take this chance! Here are a few how-to’s and interesting things to note about these tools. The fact is, these tools are expensive. Well, they can be… If there’s ever an example that you get what you pay for, it’s with inch pound torque wrenches. The word on the street is not to skimp on quality. If you plan on using these often at all, invest in a good one, i.e. Snap-on tools is the most highly regarded for these tools. The point is, if you get a cheap model you’re not just worrying about the risk of it breaking or malfunctioning on you, you’re now putting whatever it is your working on at risk. One cracked surface or stripped specialty bolt and you’ll be sorry. Inch lb. wrenches must be calibrated every so often. Cheap ones usually need to out of the box. Also, be sure to keep things oiled up, especially if not using for long periods of time. Oiling the torque wrench is usually pretty easy. For example, you usually just add lubrication through a small hole that the manufacturer has built in just for this purpose. Are Your Inch Pound Torque Settings Hard to Read? Often, the scale where you adjust your settings is hard to read on an inch pound torque wrench. Picture tiny etched numbers on a shiny, cylindrical surface. You can fix this reading problem by covering the numbers with black paint (acrylic or model). Then immediately wipe it off, leaving behind paint down in the recesses of the engraved numbering.